Upon receipt of the course fees we will check your qualifications based on your video / audio material as soon as possible. After a thorough examination you will be assigned a fixed place or you will receive the full fees back. Only when the amount has been entered into the Accademia Belcanto account will the student be examined to reserve a fixed place. 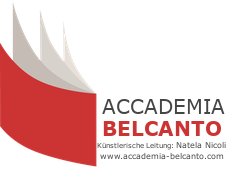 The course fees for the coaching week and the master classes must be paid at the latest 2 weeks after registration to the Accademia Belcanto account. As the number of participants is limited, we recommend a timely registration for the the master classes. The participants of the competition can take part in the coaching week as well as the individual master classes. The teachers of the master classes Eteri Lamoris, Ronald Pries and our President Natela Nicoli will also sit in the jury of the competition. For the master classes and the coaching week, all interested can register without age limit. No processing fee will be charged for the selection of our master classes. Registrations for the masterclasses will be accepted until 15th JULY 2018. All participation fees must be received by 15 JULY, otherwise an additional fee of € 20,- will be charged or the already fixed places in the master classes will be assigned to other applicants. Should you be unable to participate in one of our courses for a variety of reasons after the allocation of a fixed place, you will receive back your fee up to August 1st with the exception of a cancellation fee of € 50, - . Due to the limited number of participants, the entire participation fees will be withheld after 1 August!